Our Valentine's Day campaign was a huge success. Sales via affiliate and PayPal were made. Moreover we will attend the hy! summit and the PSI Promotion World trade fair. We were truly surprised by the more than 300 entries for our Valentine’s Day contest “Heart Wins.” Everyone who sent us an own heart on Facebook, Instagram, etc. participated in a lottery. Feedback was incredibly positive, which had a very positive impact on our reach and helped increase the number of our Facebook fans. The new love blends “Früchtchen Honigherz” (“Fruity Honey Heart”) and “Die wahre Seite des Senor L.” (“Señor L.‘s True Colors”) and the new shortbread were the most popular products in our shop during this time. The winners have been picked, and we are already focusing on Easter. Have you ever hidden tea instead of chocolate? With somebody’s own name on it…? 5 CUPS and some sugar has been offering PayPal as a method of payment for a long time. A few weeks ago, we have also become part of the PayPal shopping portal. Our initial campaign including a 15% discount for all fans of PayPal will continue until 18 March 2014. Simultaneously, our affiliate program has started with the first partners and sales. We will continuously improve the portfolio by means of high-quality partners and thus gradually increase our reach. 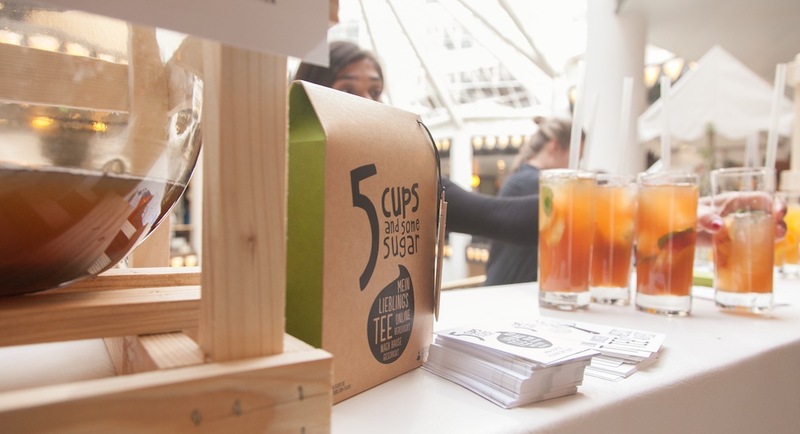 One of the hottest series of events in the start-up scene will now also include 5 CUPS. On 19 and 20 March, at hy! Summit innovative start-ups will meet investors, traditional industry, and cold and hot drinks by 5 CUPS in Berlin. At two bars, we will serve tea and iced tea and will seduce people into tasting this healthy and hip drink. Consequently, iced tea season starts early this year. Hooray! We are very busy preparing our attendance of the PSI Promotion World trade fair. The central question is: How can we draw attention to ourselves using our limited means? From 8 to 10 April, we will meet decision makers and purchasers in Hanover, Germany who are looking for the perfect gift for customers, partners, and employees, and we will make sure that they will not ignore us. For this purpose, we have added a few additional ways of individualization and new product variants, and we will further expand our B2B segment by means of our attendance, nice ideas, and new contacts. If you want to visit our stand, please email patrick@5cups.de. There are still a few free tickets left.